Home » »Unlabelled » Bhutan Celebrates The Birth Of Their Crowned Prince By Planting 108,000 Trees! Bhutan Celebrates The Birth Of Their Crowned Prince By Planting 108,000 Trees! The small Himalayan Kingdom of Bhutan, celebrated a couple of hallmark occasions this year. They celebrated in a truly mindful and subtly powerful way. As a nation they carried out the planting of 108,000 trees. 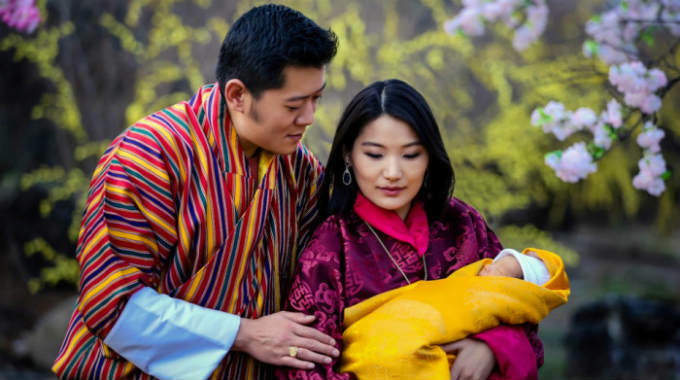 The crown prince was born to it’s current and seated monarchs: King Jigme Khesar Namgyel Wangchuck and his wife Queen Jetsun Pema. This royal family has been called the ‘Will and Kate’ of the Himalayas. The young couple is overjoyed to be able to have their son enjoy the beauty and uniqueness of their nation. Bhutan is famous for being steeped in tradition and ‘old world’ methodologies. The nation has not only beautiful landscapes but an active, well organized spiritual presence. Bhutan’s major religion is Buddhism. It has tropical and mountainous ranges within its borders lush with protective forests and other habitats. Tendril a platform for social traditions, organized the planting of 108,000 Sokshing trees or ‘Tree of Life’. The number 108 has special meaning in Buddhist tradition. It is related to mindfulness and mastery of the positive. The country was called the eighth happiest country according to Bloomberg Business. Bhutan measures its progress as a nation monitoring what they refer to as a ‘Gross National Happiness’. Coined in 1971, it is ‘scientifically constructed index that ascribes equal importance to noneconomic aspects of people’s well-being, such as education, health, environmental protection and cultural preservation’. In fact in its legal code there is written, ‘If the government can not create happiness for its people, there is no purpose for the government to exist.’ It is like America’s younger more successful partner. The country was closed off to outsiders since the 1960’s. The nation began to let people in slowly, the international media and general public being allowed entrance in 1974. Television wasn’t present in the kingdom until 1999. Bhutan has been a democratic society since 2008. That year saw the rise of its current King. To gain entrance into Bhutan you must be escorted by a government sanctioned tour group. This strict control of influence is a way to protect their culture. Inia’s general tourism has done wonders for its industry, but left its ecosystem in tatters. The planting of the trees was carried out by 82,000 households and 26,000 volunteers. Each tree was planted with prayers and positive intentions. The celebration was also caused by Bhutan the first nation to become 100% organic.